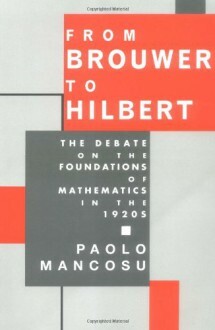 From Brouwer To Hilbert: The Debate on the Foundations of Mathematics in the 1920s offers the first comprehensive introduction to the most exciting period in the foundation of mathematics in the twentieth century. The 1920s witnessed the seminal foundational work of Hilbert and Bernays in proof theory, Brouwer's refinement of intuitionistic mathematics, and Weyl's predicativist approach to the foundations of analysis. This impressive collection makes available the first English translations of twenty-five central articles by these important contributors and many others. The articles have been translated for the first time from Dutch, French, and German, and the volume is divided into four sections devoted to (1) Brouwer, (2) Weyl, (3) Bernays and Hilbert, and (4) the emergence of intuitionistic logic. Each section opens with an introduction which provides the necessary historical and technical context for understanding the articles. Although most contemporary work in this field takes its start from the groundbreaking contributions of these major figures, a good, scholarly introduction to the area was not available until now. Unique and accessible, From Brouwer To Hilbert will serve as an ideal text for undergraduate and graduate courses in the philosophy of mathematics, and will also be an invaluable resource for philosophers, mathematicians, and interested non-specialists.